Shawn Rae explores tomorrow’s new trends for media news according to the insights of Arianna Huffington, a modern day Horatio Alger Story. 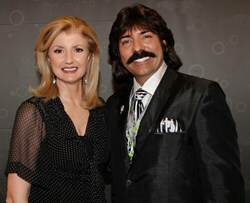 Shawn Rae met recently with Arianna Huffington at a media conference which focused on news trends and integrated media strategies. Ms. Huffington is the creator of the Pulitzer Prize-winning Huffington Post and is an iconic personality that frequents the news headlines regularly. She is a dynamic woman who has not been impeded by any perceived glass ceiling in the United States. The public has incorporated her media empire into their lives which can be ascertained by the substantial attainment of 250 million comments on her site in the last 8 years. She has also recently released a popular new lifestyle app, "GPS for the Soul", which measures a person’s heart rate and provides poetry and music to help people to de-stress. Arianna is originally from Greece, raised in a family that according to her was not without its hardships. She has stated, “I was brought up by a mother in a one room apartment in Athens with no money.” She moved to England when only 16 years old after receiving a full scholarship to study economics at Cambridge University where she attained a Master of Arts degree. While attending Cambridge she had the foremost distinction of being the first foreigner and only the third woman to be President of the Cambridge Union, a school that was established in 1869. Arianna Huffington came to the United States and achieved success on her own terms. Greeks are a minority in the USA, comprising only about 1.4 – 2.14% of the population. To be part of a small minority implies that one cannot truly depend on the aid or benefit of being a member of a larger community. Extremely self-dependent, her life reads like a Horatio Alger story. Moreover, she also rose to fame in an arena that has been historically cornered completely by men. Ms. Huffington, in spite of being a foreigner, speaking with an accent and being a woman, has managed to accomplish what very few women or men have been able to do in a single lifetime. Namely, she created a Pulitzer Prize winning corporation in a media world that didn’t yet exist when she was in college. When commenting about the fact that she is a woman in a predominantly male field, Arianna quotes Ginger Rogers about women being able to do anything men can do and “do it backwards and in high heels”. How did she do it? What did she do differently from all the rest? Ms. Huffington is an elegant extemporaneous speaker. The first thing she tells her audiences is that in order to stay abreast of trends it is of the utmost importance to be a great listener. So, she listened. She remarks that audiences today like to hear stories that tell of good news, inspiring her to create the ‘good news’ section of the Huffington Post. It is filled with personal stories of success and triumph over hardships and challenges. She explains the importance of being extremely responsive to her readers, making sure that they have a voice and that it’s heard. She has also made it of paramount importance to have a cohesive team of people that can be trusted. She explained that the team members need to be truly empathetic with their audience and also have the ability to work autonomously. Ms. Huffington feels that the internet has equalized the playing field among all citizens. She enjoys the fact that the internet does not know and therefore cannot discriminate between the haves and the have nots or suffer racial bias. It is apparent that her visible success comes from her profound understanding of her audience. So where does Arianna see the future of the internet experience for audiences? She said the trend that she observes is that of a more local nature. She sees that people are no longer using the internet solely to search for information but instead to search for meaning; yearning to understand their life purpose. She explained that the present trend of corporations is to associate their brands with a cause and that this trend can be seen on an individual basis as well. People are not only longing to search for meaning within their lives but for ways to be actively involved in their communities so that they can be a part of bringing about significant changes for the better. The internet, which on the surface appears to be a solitary endeavor, is ironically bringing people closer together. Civic minded individuals are finding each other and working together towards greater harmony in their local communities and around the world. This auspicious trend indicates, as Arianna has aptly noted, that now is the time for the media to do more ‘listening’. Shawn Rae is a humanitarian, speaker and international recording artist who is committed to share his resources, time and effort in supporting causes that alleviate homelessness, hunger, disease and despair. For more information: Shawn Rae Video Biography 2013: http://youtu.be/jBt9I3g362Q or http://www.ShawnRae.com .